Please join us for student-facilitated Questionshops. 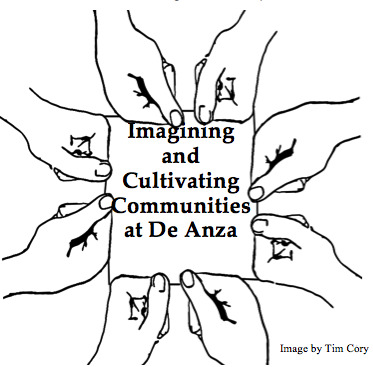 Help cultivate deeper forms of community among our students and colleagues at De Anza. Please Register by Friday, Feb. 24! Breakfast and lunch will be provided to those who pre-register. Staff, faculty and administrators will have the opportunity to share ideas during highly interactive sessions focused on the power of community. In each session, “presenters” will pose a question in 15 minutes or less, and then trained student facilitators will engage participants in a discussion to more deeply explore the question. All De Anza staff, faculty, and administrators were encouraged to submit workshop question proposals consistent with the conference theme. Opening: 8:30 a.m. - 9:30 a.m. Session 1: 9:40 a.m. - 11:00 a.m. Question: Given the deeply pervasive stigma of the model minority myth, what can we do to INCLUSIVELY serve the students in our community who don't fit this stereotype, but are inevitably overlooked because of this label? Question: What is a mentor’s role in building community? And how does it improve classroom management and student success? We’re All in this Together, Aren’t We? Question: How can managers work collaboratively with staff and faculty to create and sustain community? Question: What do faculty outside of the traditional basic skills departments (math, reading, writing and ESL) need to know and do to support and engage students with basic skills needs? Does De Anza Need a Poor People’s Club? Question: For every ten poor students who get into college, only one finishes. Because poverty and unemployment are shameful, people do their best to “pass” as middle class and when they can’t, rather than speak up, they slide out of sight. Would a students-only club be best or could students, faculty, and staff all benefit from such a club? Question: How do we bring the social from social networks into our classroom in meaningful and sustainable ways to create a student driven engaging and empowering technology enhanced learning community? Session 2: 11:10 a.m. - 12:30 p.m. Question: How can we approach students' educational needs in ways that are culturally relevant & responsive while incorporating best practices in a spirit of community and efficient interrelationship? A discussion and dialogue focusing on enhancing the interface between great ideas, talented educators, various teaching/learning resources on the De Anza campus and the challenging academic dilemmas we often face. What Does Community Sound Like? Question: What positive actions can you take each day to acknowledge individual students, while inspiring colleagues to follow your lead? Question: How do I get started with community and civic engagement in my classroom? Would You Teach Differently if You Didn’t Have to Give Grades? Question: Can the Student Learning Outcome (SLO) process, have the potential to capture more learning-centered models of academic merit at the course, program and institutional levels? What Can We Do to Build Community for our Older Students? Question: What are some concerns expressed by students who are older than 30? What can we do to help them fully participate in the college? Question: How can we improve our students’ success in science classes and help them discover fundamental biological principles in the most basic of their day to day tasks and in their lives at home in their communities? Question: How does lack of social and cultural capital prevent some students from engaging fully in an academic community? How do social structures impact the way our students feel part of a classroom community? How does our social class, attitude and privilege create a barrier to building strong communities in the classroom and beyond? Lunch: 12:30 p.m. - 1:30 p.m. Lunch provided for pre-registered participants, presenters, and facilitators in Conference Rooms A and B and may be purchased in the cafeteria for those not pre-registered. Session 3: 1:40 p.m. - 3:00 p.m. Question: How do we encourage the building of faculty and student communities that improve student experience in developmental math and statistics? Question: How can we honor our students' own challenges and celebrate our students' accomplishments to cultivate a sense of community? Question: How could we build lasting community among faculty within departments and across campus at De Anza? Question: How can we help ESL students take the lead in creating a genuine sense of the global community at De Anza? Question: How can we support our students in moving beyond diversity awareness or a desire to achieve cultural “competence” to a deeper sense of cultural humility and a commitment to shared quality or equity in our community? Question: How can we use the principles, assumptions, and behavioral tools of Nonviolent Communication, together with a critical framework for understanding our roles and responsibilities when we hold different positions of power, to develop a way of engaging conflict that results in greater mental, physical, emotional, and spiritual connection? Question: What are some ways that we can be more welcoming and accepting of the wide variety of mental ways of being among the faculty, staff and students who are members of our community? How can we authentically engage with each other across mental differences on our campus? Closing: 3:10 p.m. - 4:00 p.m.
A sense of community … signifies the presence of an agenda of common caring and grace. This agenda of common caring embraces a love for soul, for standard, and for system. There is a caring for the individuals in the community, for those whose welfare is held in trust. There is a caring for a standard of excellence and integrity. And there is a caring for the policy and physical systems in which men and women relate in both work and play. Central to the essence of community is the other face of love, which is forgiveness. The simple truth about community is that it gathers around such personal virtues shared and multiplied. That truth becomes more pointed when we turn it around: community cannot, and will not, gather around smallness of mind, tightness of heart, banality of spirit, frenzy masquerading as efficiency, myopic views of reality, faddish techno-babble, obsession with the bottom line, or the fear that is masked by arrogance in too many intellectuals' lives.